Campus IT leaders aren't wildly enthusiastic about the investments in technology their institutions are making. In just a single area — student recruitment — do at least half of these individuals (52 percent) rate the IT investment "very effective." For every other category, fewer than 50 percent give it the same high rating, including investments in technology for teaching and instruction on campus (49 percent), library services (46 percent) and student success initiatives (40.5 percent). In three areas — alumni engagement, data analytics and development efforts — fewer than 20 percent rate the investment as very effective. These were just a few of the data points pulled out of the annual Campus Computing Survey, produced by Kenneth Green. This year's results were based on data provided by senior IT people from 242 colleges and universities, representing two- and four-year public and private nonprofit institutions. 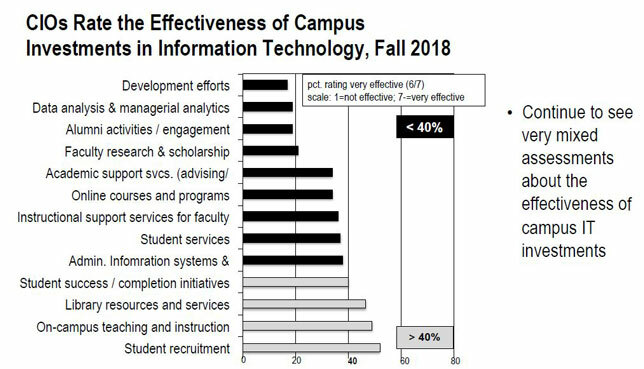 While two-thirds of respondents (65 percent) insisted that "assessing the benefits of campus investments in computing and technology resources" was a "very important" institutional priority, just a small portion of schools (16 percent) have a formal program in place to assess the impact of IT on instruction and learning outcomes. In fact, noted Green, the percentage of colleges reporting formal IT assessments has continued dropping over the last 10 years, from 21 percent in 2007 to 16 percent in fall 2018. "Absent any assessment, faculty and campus officials are left with either opinion or epiphany, rather than evidence, about the impact of these efforts," he wrote. There's "rising" support for open educational resources. Two-thirds of schools (64 percent) are encouraging faculty to use OER content in courses, up from 34 percent in 2014. More than half of the campuses (52 percent) support faculty efforts to develop OER content for their courses. Yet, a large share of respondents suspect their faculty are dubious of OER course materials compared to the commercial textbooks and ancillary materials they're used to; just 38 percent said their faculty consider OER comparable in quality. As Green pointed out, "Many faculty may view institutional efforts to promote OER as a challenge to the professorial prerogative to select textbooks and other course resources." IT disaster recovery isn't a concern across the board. A sizable portion of schools (31 percent) haven't updated their plans in two years. The public universities and colleges are more likely to be up-to-date with their disaster planning than the privates. Under a fifth of respondents (19 percent) assessed their IT disaster planning as "excellent." The jury's in on the use of artificial intelligence but out for augmented reality and virtual reality. Four in 10 survey participants (42 percent) said that AI would be an "important resource" in analytics in the coming years, up from 30 percent in 2017. Respondents suggested that AI would play "an important role" in instruction and become embedded in management software routinely used by campus administrators. Fewer people (26 percent) anticipate the same level of institutional impact for AR and VR, however. One possible: The use of AR and VR "will depend on the decisions of individual faculty and academic departments." Blockchain generates mixed messages. While 45.5 percent of respondents agreed that this technology would "dramatically transform the ways institutions manage student data and transcripts," just 17 percent said blockchain would be very important for their institutions in five years. The 2018 report is openly available on the Campus Computing website.